I read this article and found it very interesting, thought it might be something for you. The article is called The Amazing Jekyll & Hyde Story Of India’s State-Owned Liquor Barons and is located at https://archive.indiaspend.com/states/the-amazing-jekyll-hyde-story-of-indias-state-owned-liquor-barons-45169. Most of us know that excise duties from alcohol sales are a major revenue source for state Governments in India. Fewer would know or have noticed that over the years, most state Governments have floated corporations or public sector undertakings (PSUs) to supply ‘quality liquor’ to the people. The ostensible reason for this is that citizens don’t fall prey to illicit hooch or cheap alternatives.And there might be other revenue-linked reasons as well. Several states in India run such corporations. They include Tamil Nadu, Rajasthan, Bihar, Kerala and Jharkhand. 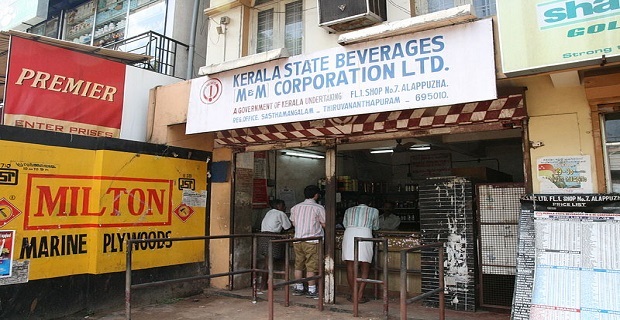 But one state where the contrasts are perhaps starker than elsewhere is the southern and small state of Kerala, under the reign of the Kerala State Beverage Corporation, or Bevco as it is known. Where the selling of alcohol is so lucrative that it brings in 15% of the state’s revenues. And unlike perhaps other such state-run businesses, its sales (and thus liquor consumption) have been rising dramatically in recent years. We dug a little deeper into Bevco’s liquid fortunes. Bevco is the only (official) source for authentic Indian Made Foreign Liquor (IMFL), beer, wine and even foreign liquor for Kerala. Yes, IMFL is an unusual category-definition. Bevco has been around since 1984 and has 22 warehouses across different districts and 338 retail outlets. The corporation is run by a 5-member board of directors, and the current chairman is Anil Xavier who is also the Commissioner of Excise. Remember, Kerala is a small state in size with a population of 33.38 million. Supplies for Bevco pour in from global giants like Diageo and Carlsberg and national brands like the UB Group, Radico Khaitan and Jagatjit Industries. Bevco has been making profits (albeit on a declining basis for the last couple of years) but contributes heftily to the exchequer. While purchases have been going up steadily, let us look at the sales chart, and you can see the huge jump in numbers – volume as well as value. 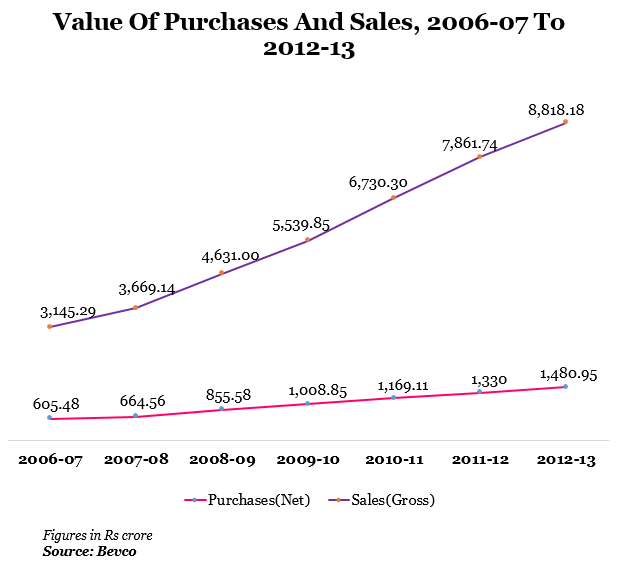 So, sales have nearly doubled to Rs 8,818 crore in 2012-13 from Rs 4,631 crore in 2008-2009. If we go back to 2001, sales for Bevco have jumped 4 times from Rs 1,337 crore to Rs 8,818 crore. And what’s the contribution of the corporation to the state exchequer in the form of levies like sales tax, excise duty and license fee? Well, the figure has increased from Rs 1,025 crore in 2000-2001 to Rs 7,241 crore in the last financial year or 15% of the state’s revenue. 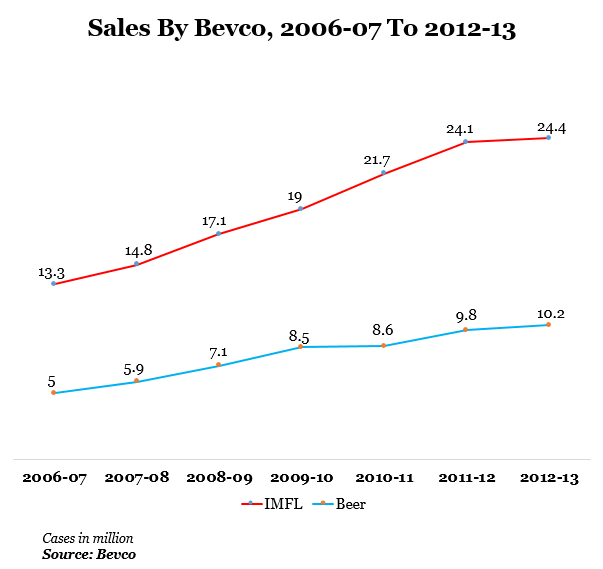 The good news, if you might call it that, is that Bevco’s sales growth is declining. For the first five months of the current financial year, the growth has only been 3% compared to over 12% growth in the previous financial year. The Onam period (a 10-day festival in the state) is considered to be the peak season for Bevco, and according to data released by the corporation, sales declined 2% to Rs 326 crore from Rs 333 crore. 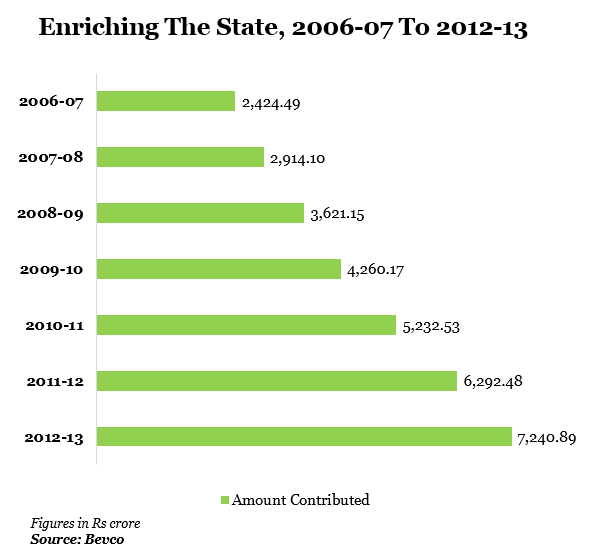 However, Bevco continues to be profitable even after increasing its contribution to the state coffers. Though, for reasons not evident from our study, margins have dropped – from a profit of nearly Rs 260 crore in 2009-2010 profit, it was down to Rs 81 crore in 2011-12. And the numbers for 2012-13 are not yet public. Kerala’s revenue receipts, as per revised estimates for 2012-13, totalled Rs 48,269.21 crore. Bevco contributed around 15% of revenue collected the previous year. The state is expecting to collect over Rs 58,000 crore as revenue in the current year. Going by trends, Bevco is likely to keep increasing its share in the coming years. 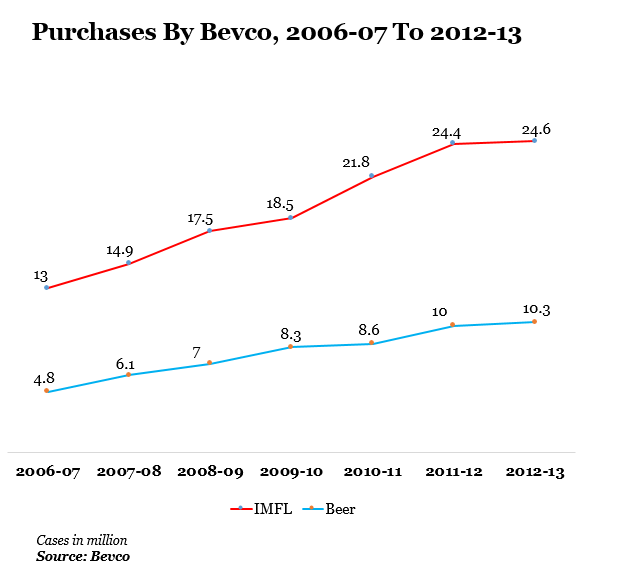 Bevco’s fortunes also reflect, as we pointed out, rising consumption. Kerala’s Economic Survey 2012 says the state has the highest per capita consumption of alcohol in India – more than 1.76 gallons per person a year. Kerala is followed by Maharashtra and Punjab. And while the Government is raking it in from Bevco, bizarrely (as it sounds) it is also spending money on de-addiction. Budget 2013-14 has allocated over Rs 6 crore to start 63 de-addiction centres across the state. Bevco’s evident success apart, not surprisingly, the high alcohol consumption figures are worrying some people. Johnson J Edayaranmula, Director, Alcohol & Drug Information Centre (ADIC)-India, an NGO on substance abuse prevention, says over Rs 16,000 crore went out of the pockets of the common man because of this habit last year. Edayaranmula quotes data from the National Family Health Survey – 2009 which says that 33% of the adult population of Kerala has tasted alcohol, including 3% women. “Of this 33%, 6% drink daily, which is an alarming number,” he says. He is also quick to point out the positive that 67% of the adult population abstains from alcohol and that includes 97% of the adult women. “Cure is never a solution for alcoholism. It never works. Prevention is the only way ahead, and it has to be focused on evidence-based social approach,” Edayaranmula says. Interestingly, he says that market for alcohol, sales and its consumption is declining worldwide except in South-East Asia and Africa regions. He feels India should follow the example of Thailand, Korea and Malawi which have formed ‘health promotion’ foundations with multiple departments as stakeholders.